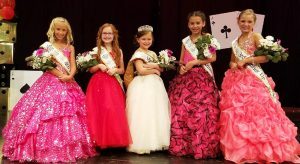 From a field of 16 contestants, Addison Geiser was named and Miss Wee Pop 2017 during competition held Saturday morning at River Valley High School. Five-year old Geiser is the daughter of Amber and Ryan Geiser of Hilliard. She also won her age division in Formal Wear, Swimwear and Photogenic. 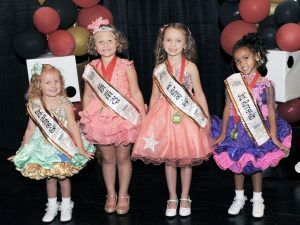 (L – R): 3rd Runner-Up Paisleigh Caskey, 2nd Runner-Up Heaven Lutz, 2017 Miss Little Wee Pop Princess Gracyn Mattox, and 1st Runner-Up Mila Holman. 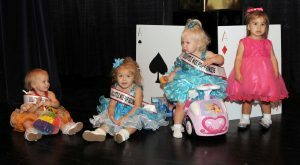 Nineteen contestants vied for the title of Marion Popcorn Festival’s 2017 Miss Little Wee Pop Princess at River Valley High School Saturday morning. The title was captured by 22-month-old Gracyn Mattox, the daughter of Katie Hoffman and Justin Mattox of Mt. Gilead. She also won overall honors in Formal Wear and her age division in Popcorn Wear. Paytn Smith was chosen Miss Teeny Pop 2017 Saturday during competition at River Valley High School. Smith also took Overall honors in Formalwear and Popcornwear, as well as her age division in Talent with her rendition of “No Strings Attached”. Although not a factor in the outcome of the competition, Smith won an award for most ads sold. The seven-year-old daughter of Jonathan and Tiffany Lechleitner of Marion is in the 2nd grade at Garfield Elementary. Pictured (l to r) are Mr. 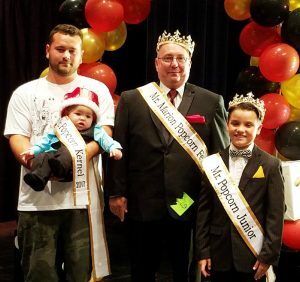 Popcorn Kernel Karson Freeman (held by his father, Brandon Freeman), 2017 Mr. Popcorn Don Bennett, and Mr. Popcorn Junior Brody Cahill. The Miss Teeny Pop Pageant will host a Family Photo Day fundraiser on July 9, 2017 at the American Red Cross, 1849 Summerset Drive in Marion. The event will take place from 11:00am to 3:30pm, but reservations are required for the limited spots available. 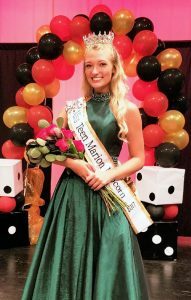 The 2017 Marion Popcorn Festival Miss/Ms Popcorn Pageant Informational Meeting will be held Saturday, June 24, 2017 at bluefusion Fun Center, 1340 Mt. Vernon Avenue, Marion from 2:00 p.m. until 4:00 p.m. The informational meeting will allow individuals the opportunity to ask questions regarding the pageant. For additional information, please contact Lynn Jamison at 614-205-9349 or lynn.jamison@experis.com. An informational meeting for the Miss Teeny Pop competition will be held on June 10, 2017 at 1:00pm at Blusfusion Fun Center, 1340 Mt. Vernon Avenue in Marion. If you cannot make the meeting, you can still get details on the event and an application by clicking here. For more information, contact Marissa Oliver at marissaoliver22@yahoo.com or mpfmissteenypop@yahoo.com. Alternative pop/rock band Gin Blossoms and southern rockers the Georgia Satellites have been named as the headliners for the 37th Marion Popcorn Festival. Gin Blossoms will take the main stage on Friday, September 8, and Georgia Satellites are set for Saturday, September 9. Both performances begin at 8:30 p.m. and are free to Festival attendees.